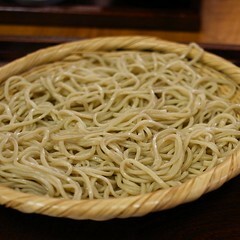 I have always wondered what makes the simplest staples such as buckwheat soba noodles taste so good. What is the secret that sets some restaurants apart from others? Last February, Sake Brewery Tours group learned how to roll out soba from Sato-san, a master, who joined us in a historic building at Kariho sake brewery in Akita. For many guests, it was their first time making soba. 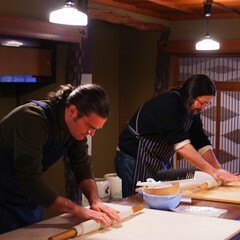 Under Sato-san’s very good instructions–and with some hands-on help–we kneaded, rolled, and cut our own fresh soba. While we were waiting for the noodles to boil, Kariho’s toji, or brew master, told us some amazing tales. He took us back 30 plus years to when he had started working at the brewery. When the noodles were ready, we enjoyed them with some just-brewed Kariho. Nothing could have tasted better. Everything was just so magical and that whole experience at the brewery was definitely one of the highlights of our five day in the snow country! The soba master, Sato-san and his family own a restaurant in Kakunodate where the group spent the night. 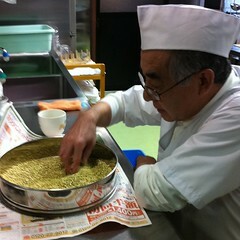 So, the next day, some of us visited him at his shop called simply, Kakunodate Soba. 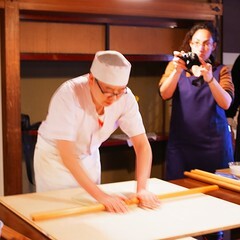 Again, we watched him roll out soba. This time he was in his own soba station with a huge wooden board on the counter next to the giant green soba grinding mill. He does this behind a glass wall so the diners can see his work as well as taste it. Just like the previous day, the soba I had was great-simple, but perfect. I know many soba shops grind the seeds to make their own flour, but I had not heard of a place where they husk the soba in-house. When Sato-san came back, I expressed how taken aback I was to learn how much work goes into preparation. “Do you have some time?” He invited me to the back of the restaurant to see his workshop where his seeds are prepared before milling. After learning the whole process, I was even more surprised to see how much care and time go into a simple bowl of noodles. Sato-san’s approach reminded me of sake brewing. First, he showed me the giant refrigerated room dedicated to keeping the bags of buckwheat after it comes from a grower. Then, in the back room, he had two big green machines, one was tall and another one was low. One looked like a small rice milling machine like you might see at a sake brewery, so I assumed it is for husking. But, I could not figure out what the other short machine was for. 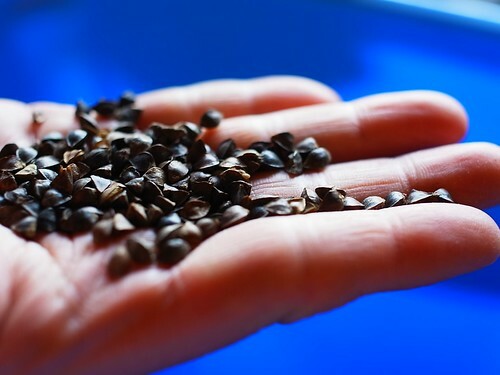 Sato-san scooped black seeds from a blue bucket and said, “These are pretty clean when the growers ship them to us, but first we have to polish them. We clean off any trace of dust or unwanted bits by running a batch through this machine.” Then, he picks up metal plate with many holes all the same size. He explained the next step to sort the polished seeds by running them through the screen. There is a series of ten screens with ever smaller holes. Thus, everything is sorted by size before the soba goes into the tall husking machine. This kind of attention improves the husking process. Even after all of this, there are going to be a few unhusked ones in the mix. So, he uses a metal sorting plate again to separate husked and unhusked ones. Unhusked ones go back to go through the machine again. We did not even get into his dashi broth at all. Nut, his soba sauce has just the right balance of dashi and soy sauce. I imagine the same philosophy he has about noodles goes into his sauce. I never knew how complex it was to make this simple meal. I finally found the answer to my question. Now I know the secret. If you are visiting the beautiful, yet very relaxing historic town, Kakunodate in Akita, you can try their soba yourself! They are open for lunch only and close once they have served all soba they prepared for the day. Access: Kakunodate Soba is located between Nishinomiya-ke and Ando Jozo. It is a few houses up the street from Nishinomiya-ke. 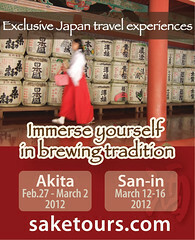 Please join the Sake Brewery Tours to Akita in 2012 to taste and see the sake and soba master craftsmanship yourself! Wow a simple bowl of soba is really not that simple if you were to make it from scratch eh? The amount of work and effort put into soba is crazy. Thank you for the informative post, I really enjoyed reading it.